Since my first encounter with these monitor loudspeakers back in the mid-90s, I have been looking out for an affordable pair... So, when these turned up at The Emporium on the same day I got a pay rise, I couldn't resist! The SCM20SL is a relatively compact stand mounting model, employing two drive units in a sealed enclosure which uses a deep-and-narrow form factor to help make the model less visually imposing while appearing solid and purposeful. Your first impression of these speakers will be the weight - 23Kg each. While the enclosure is substantial, using 18mm MDF damped with self-adhesive bitumen pads, the bass driver is responsible for a large proportion of this mass. The baffle is double-thickness and fully-removable if required. I rather like the engineering here - the gloss-black baffle is smaller than the front of the enclosure and provides a neat recess for the gille frame, thus ensuring the sonic effects of this are relatively benign. The grille frame itself is a serious work of engineering, most of which is hidden by the cloth. The edges are rounded over, but there is a slotted section of thin plywood that fits into a recess in the frame to hold the cloth away from the baffle - hard to describe, but neat in practice. The baffle is neatly rebated so the drivers are flush with it. 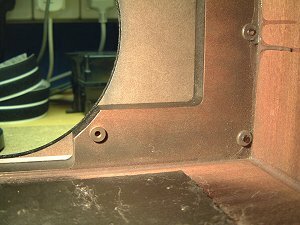 These views of behind the baffle demonstrate the superb results of their CAD/CAM systems - you can also see the metal inserts that receive the serious M6 machine bolts that retain the drivers and baffle. No doubt about it - this is an impressive woofer. 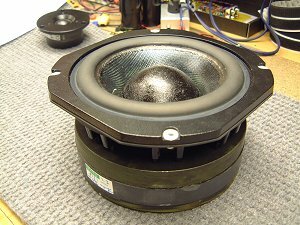 The high power voice coil is 75mm diameter, and adopts the "short coil, long gap" principle to maintain linearity at large cone excursions. This is connected to a woven cone and 3 inch soft dome, both of which are hand-doped with a rather sticky damping material. 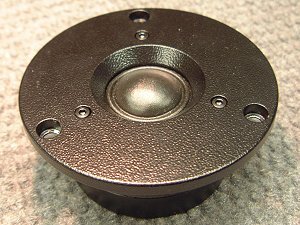 To assist with heat dissipation and control cavity resonances, the pole-piece is vented by a large (about ½ inch) hole drilled though the centre of the back of the driver. 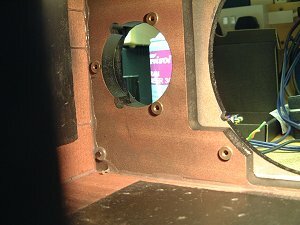 Also, the voice-coil former has holes in it - you can just about see this by looking carefully at the reflections of the coil former on the plate shown in the pictures below. 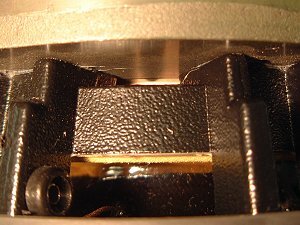 Note the gap between magnet and the cast alloy frame that exposes the void between the rear of the spider and the magnet - normally this is enclosed to help keep debris from the magnet gap, but this forms another cavity that could be another source of colouration. I found the free-air resonance to be 45.8Hz - the system resonance is 59.3Hz. 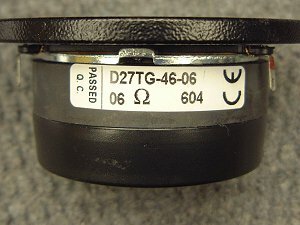 You can also see the rubber gasket and white plastic bushes that help locate the driver in the baffle, while providing a degree of mechanical decoupling. The magnet, which only just fits through the baffle cut-out, features SL (Super Linear) technology. Essentially, this is a layer of magnetically permeable insulating material to prevent eddy currents forming within the pole pieces. 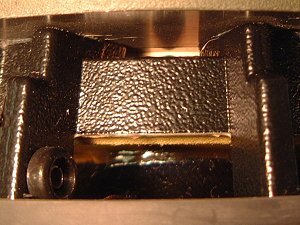 This shows itself as a thin groove, approximately 8mm from the voicecoil, as hopefully shown here. This was extremely difficult to photograph, hence the two, slightly different shots. My examples have been rewired with some DNM solid-core cable. While this is expensive cable, and well-regarded by some, I don't feel that it is appropriate for these speakers. It is rather thin for my liking, and I anticipate replacing it soon. 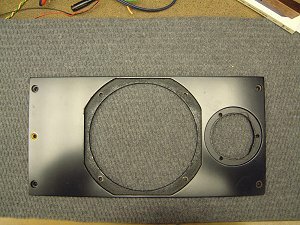 The crossovers are assembled a high quality double-sided PCB mounted on the rear panel. Compared to the Rogers and BBC designs I have studied, the crossovers are refreshingly simple. This is a sure sign of good quality drive units that behave well within and beyond their normal operational range. 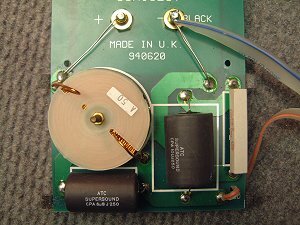 Since originally writing this page, I've acquired a Marconi LCR bridge and had planned to measure the inductors at some point in the future. But thanks to Robert Hoyle for supplying me with the values, saving me the effort of dismantling them again! You'll notice the buy-wiring terminals. 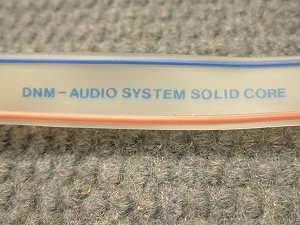 The misspelling is intentional, as it's hard to believe that a pro-audio oriented company like ATC really believe in it. Do a search on Google Groups and you'll find some posts that imply this might have been a 'marketing' decision. The bass and treble sections of the crossover are shown here. 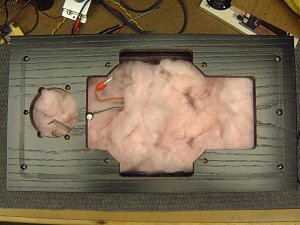 The bass path is a simple 12dB/octave LC filter, with an RC impedance-correcting network in parallel with the drive unit. 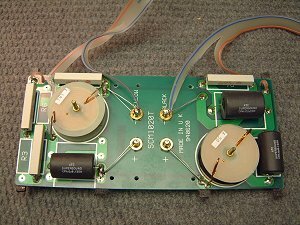 For the treble, a similar LC filter is followed by a resistive T-section attenuator to bring the tweeter level down to match the woofer. 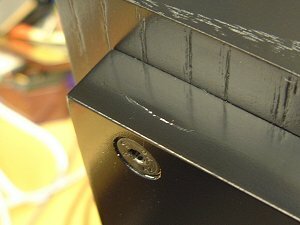 One of the loudspeakers suffers from hairline cracking at the tops of the baffles - it looks like the machine bolts were overtightened when the internal wiring was "upgraded". It's the same story at the bottom of the baffle where there are three bolts securing it. 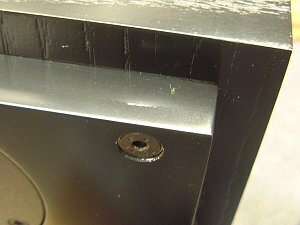 The other loudspeaker shows early signs of this, but the paint hasn't cracked yet. I've slackened the bolts slightly (while checking for air leaks) to hopefully prevent this problem getting worse. I think it is probably nothing to worry about beyond cosmetics. Wonder how much ATC charge for new baffles? At the start, I should say that these speakers are not for everyone. They do not sound "nice", and with a recording that is anything less than perfect, the sound is not good. Instead, what they offer is a forensic insight to the recording with no attempt to cover up any problems with the source material, or indeed the preceding equipment. Look at it another way: poor speakers sound poor with poor, average and excellent recordings. Average speakers will never sound better than average. Highly revealing monitor speakers sound poor with poor recordings, merely average with average recordings, but absolutely superb with the best recordings. But of course, not everyone is ready for the truth! If a recording engineer mixes using bass-heavy speakers, chances are most people will think the mix sounds bass light compared to average. Similar arguments apply elsewhere in the frequency spectrum. If an engineer wants a mix that "translates", it's crucial that the monitor speakers are absolutely neutral. Such speakers must also have low levels of colouration and harmonic distortion, and the ability to work at high levels is also necessary. All of this requires the sort of serious engineering that you've seen on this page. At the time, I had been using the BBC LS5/9 as my main speakers. 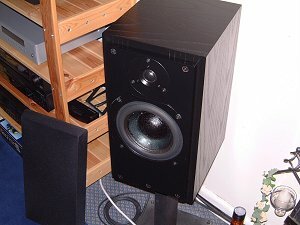 These are an acquired taste, but personally I feel that apart from the rare and fragile LS3/6, these are perhaps the closest the BBC got to producing a true monitor speaker in terms of honesty - but they aren't popular within the BBC for precisely that reason; people tend to prefer the coloured LS5/8 or LS3/5A. But '5/9s can work really well in a properly set up system. As Alan Shaw points out, the 5/9 isn't completely flat through the midrange. Upon switching to the SCM20s, you can see what he means. The '20s are much more consistent throughout the entire spectrum; both the bass and treble ends are cleaner and more extended. The bass end is especially eye-opening as while I'd regarded the LS5/9 as being generally quite quick and clean at low frequencies, the SCM20s are much, much better. 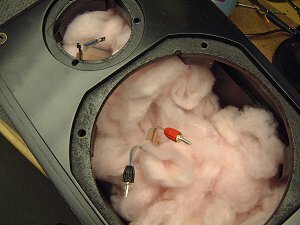 Being sealed, there is no port noise - also the bass falls away at a much more gentle rate, meaning that they are surprisingly extended for their size. The main drawback with the SCM20s is that they are very inefficient at only 84dB for 2.83V at 1m. This is actually about the same as an LS3/5a, but the ATCs can be driven with 10 times the power! Serious amplification is required, and needless to say, my old Musical Fidelity A1 was somewhat uncomfortable with these. Currently I'm using my A4 power amplifier in bridged mode, which produces comfortably more than 150 watts per channel and is a great match for these loudspeakers. The dynamics of this combination is simply staggering - that 3 inch voice coil is able to soak up large amounts of power without suffering from the thermal compression effects that plague many other designs. The human ear tends to interpret distortions as volume and thus not realise how loud undistorted sound is. 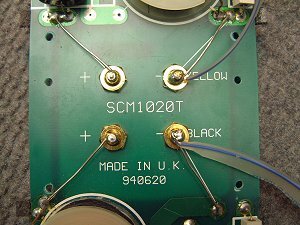 The SCM20SL, like all ATC monitors has very much lower distortion than conventional systems. It is therefore a good plan to start listening at an artifically low level and carefully increase the volume. 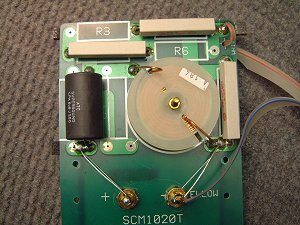 It is possible for the SCM20SL to produce sufficient SPLs for your ears to intermodulate and this will make the speaker appear harsh. Comparing these carefully to the BBC LS5/9 was interesting, the latter sounding somewhat "wooden" with certain material (particularly piano) thanks to a colouration occurring somewhere in the lower midrange. The improvement in treble extension and clarity is very welcome, and the overall level of transparency is rather striking. But despite being very detailed and analytical, I find that these speakers can also "disappear" given good quality source material - they are very good at simply playing music without imposing their signature on the sound. While I might supplement the bass response with a decent sub-woofer, I can't see myself changing them in the future.